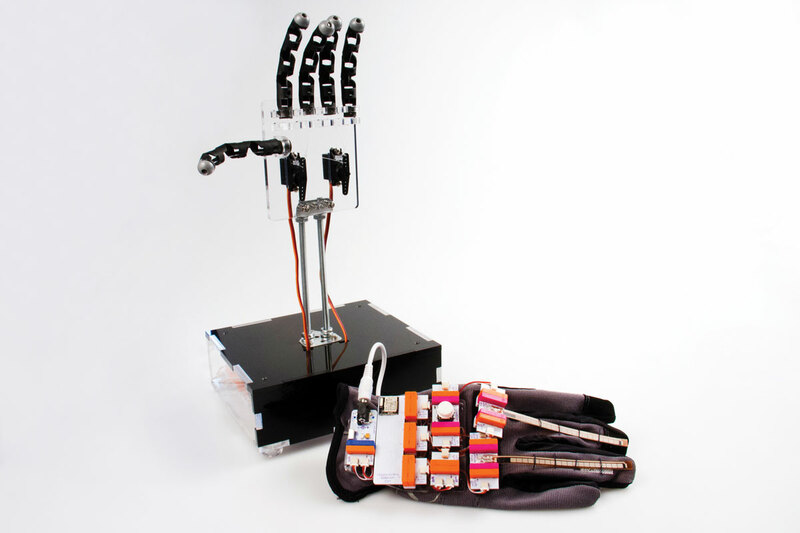 LittleBits’ flexible sensors and Arduino module let this glove’s wearer engage in a game of animatronic Rock-Paper-Scissors. A collection of pre-launch Bits. LittleBits founder Ayah Bdeir works on an early prototype. The adoption of the system by serious companies like Quirky reflects some of the latest moves that littleBits has been making as its product line grows in scope and capability. Developed by MIT Media Lab and Eyebeam alum Ayah Bdeir, the first prototypes popped up online in 2008. 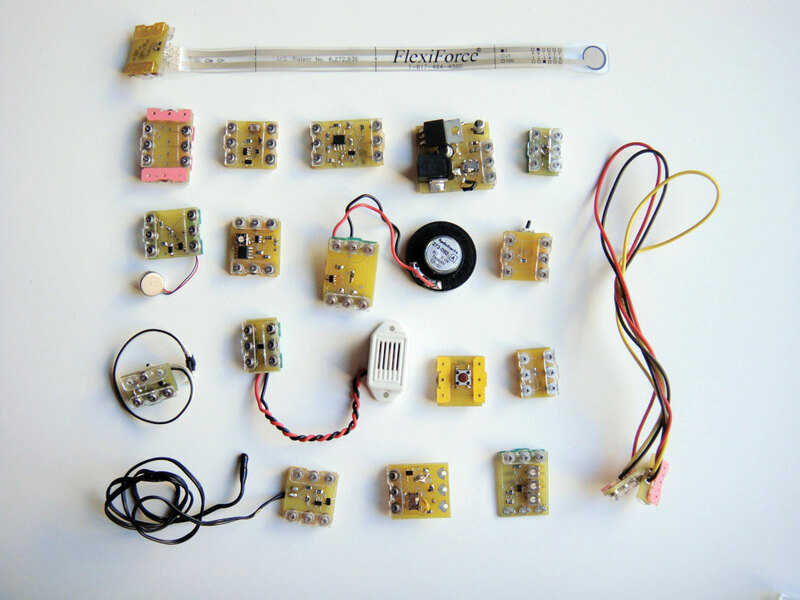 The product officially launched at World Maker Faire NYC in 2011 with the 10-piece Starter Kit, which included a pushbutton, slider, and LED bar graph bit. Initial marketing highlighted projects made from paper and cardboard with a fun, simple aesthetic, lending to a kid-friendly educational image for the product — which was not something that Bdeir had in mind as a long-term strategy. 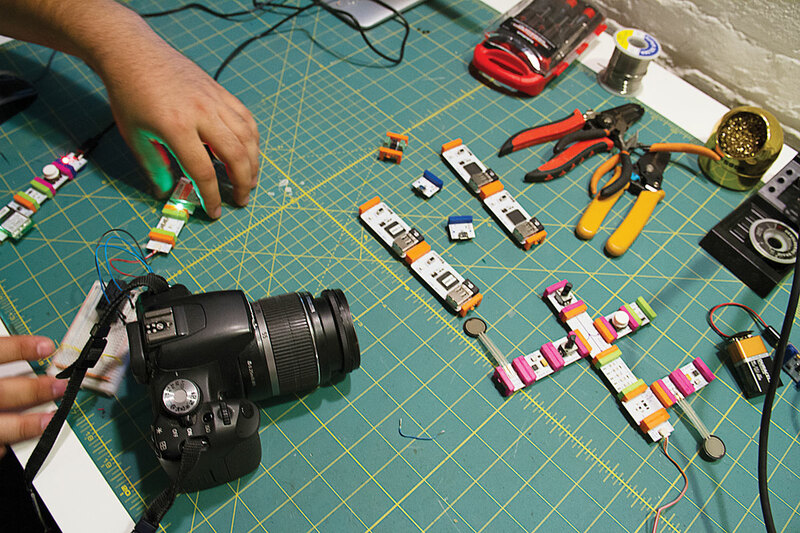 That next big idea might come from one of the latest bits in the littleBits catalog, the cloudBit. The piece enables wi-fi control of your circuit in various configurations — from the internet to the bit, from the bit to the internet, or from bit to bit. Coupled to a project made from a mix of the now more than 60 littleBit pieces (“There are trillions of billions of combinations,” Bdeir proudly states), the new component lets a total novice quickly and easily enter fabled “Internet of Things” territory. Smartphone-controlled pet feeders, a doorbell that sends you an SMS message when pressed, and appliances that adjust their output to environmental conditions are just a few of the early ideas shown with the cloudBit’s July launch. Bdeir sees this new component as a way to use the internet as a building block or material, an alternative to allowing massive companies like Google — which owns Nest — and Apple — which has an upcoming connected home endeavor — prescribe their IOT devices to us. It mirrors her support for the Open Hardware movement, which she helped define as co-founder of the Open Hardware Summit. Bdeir also produced the Open Hardware logo competition, resulting in the now-common gear design that graces hardware that use the open license — including her bits, but not the magnetic connectors, which remain patented to her company. The schematics to those circuits can be found in a Github repository, and Bdeir welcomes people to use them to make their own pieces and learn more about electronics. 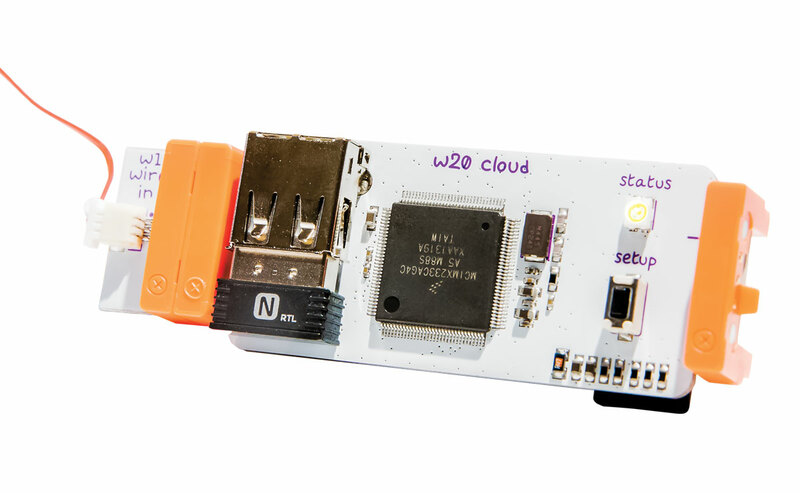 Among the other recent littleBits releases is their Arduino module, launched a few months before the cloudBit through the official Arduino at Heart program. It’s a simplification of a platform that already simplifies electronics prototyping, and could push both companies to mainstream adoption by eliminating breadboards and finicky components while introducing incredible programmability to a user’s creations. Other advanced components are on the horizon as well — Bdeir hints at a camera module and an AC power-tail component, and she says to peek at the idea submissions on their site for other possibilities. The current look of the components. The Arduino release isn’t the only partnership with an outside company — over the past year, littleBits worked with instrument maker Korg to release a build-your-own synthesizer kit, and with engineers from NASA on a space kit that includes pieces useful for recreating rovers and satellite dishes. And with the plug-and-play capabilities of the pieces, it’s hard to not want to combine them with Lego kits — which Bdeir says helped inspire her creation, alongside the concepts of object-oriented programming. But while a Lego partnership might be a long shot, she is excited about some of the upcoming collaborations.